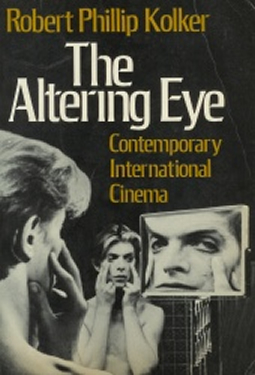 The title of Robert Kolker’s The Altering Eye alludes to multiple things – the eye of the filmmaker that sees the society, the eye of cinema that observes its own content and the eye of the audience that facilitates a response to the images it witnesses. And true to its title, Kolker’s book attempts to explore the way these “eyes” have altered their own vision, refined the meaning derived, redefined the process of watching images and essentially understand the emotional and intellectual response they evoke. I read The Altering Eye over a period of 3 to 4 months (interrupted by a few other books) and as I finished reading the last passage, it felt as if I had performed a feat. The book, now, seems so detailed, so vast and so verbose that I begin to wonder if all critical books on cinema would turn out to be like it. The semblance of vastness of the book partly comes from Mr. Kolker’s style of description and analysis. He starts out discussing schools of thought, covering almost six decades, from a very broad perspective after which he adds detail, bringing in specific works during the period and key figures behind them. Additionally, he talks about the themes of the films, dissecting their screenplays and illustrating their position in film history with respect to contemporary and ancestral works. Furthermore, he often narrows down to specific shots, and sometimes even frames, to excavate details that reinforce his arguments. And suddenly, as if zooming back, he moves on towards the next school of filmmaking to examine its style and substance, the deviations from the existing system and the drawbacks that eventually caused its downfall. As a result, you feel as if Mr. Kolker has covered a huge amount of ground with considerable detail. Of course, I could crib about the exclusion of major directors from Asia and America, who are grossly ignored in the book. But that objection is instantly nullified since Mr. Kolker makes clear the kind of films and filmmakers he intends to dissect and the ones he doesn’t. His primary aim is to study the response of the filmmakers of Europe and Latin America to the norms and methods of the studio-based Hollywood movies. He primarily deals with filmmakers who understand the “genre” so well that they deconstruct it only to reveal its inherent flaws and later, filmmakers whose subjects are very much a function of history, current affairs and the social structures prevalent. Both these types of filmmakers (not mutually exclusive by any means), Mr. Kolker emphasizes, offer a kind of vehement reaction to Hollywood’s methods of holding the audience in an intellectual inertia and its subconscious conditioning of their morals and emotional responses. For this, Mr. Kolker divides the book into three large chapters. The first chapter titled “The Validity of the Image” kicks off with a quote from Giuseppe Bertolucci: “The Cinema was born with neo-realism”. Although Mr. Kolker refuses to take up the conventional chronology that is used to trace cinema’s growth (with the clichéd Lumiére brothers versus Georges Melies discussion), he actually presents a good picture of the history of cinema in this chapter. He superficially explores how expressionism paved the way for film noir, which lead to neo-realism in a way, which in turn resulted in the birth of the French new wave, culminating in a hybrid form of cinema in the seventies. But his main focus in this chapter remains on neo-realism as he studies the very many theories that attempted at first to destroy the bourgeois control of cinema and then create a form that captured the reality “out there”. The next chapter is called “The Substance of Form” and is probably the biggest one of the three. Here, Mr. Kolker talks about redefinition of cinematic forms by directors who attempted to develop an interactive kind of cinema in reply to the reassuring continuity and passivity of Hollywood. He discusses how the directors destroyed, exaggerated and mixed genres in order to make the audience understand and work out what happened and why it happened that way. He covers a variety of experiments including fracturing of narratives, working within conventions to expose its absurdity, refusal of continuity and omniscient gaze and much more. The French New Wave, in particular, is covered in detail with an overview of every major director of the movement. The final chapter, “Politics, Psychology and Memory”, rounds off the book with the examination of the influence of history, politics and leftist revolutions on the filmmakers of Western Europe. Basing his arguments on figures like Bertolucci, Losey, Fassbinder and other Latin American filmmakers, Mr. Kolker talks about the way these films studied fascism and its effects on psychology of the post-war world. He additionally probes how bourgeois complacency, politics of sexuality, memories and residues of fascism and the left’s struggles relate to each other and gradually make their way into many of these films. Mr. Kolker successfully covers both periods – the rise and fall – of the student revolution and observes the changes in attitudes of the filmmakers towards their subject following its failure. What is most surprising for me about the book is the way Mr. Kolker examines the films to support his statements. Each analysis seems indisputable and like the only possible interpretation after all. He deconstructs a film (or a movement) into so many layers of meaning that it seems like a flawless movie until Mr. Kolker himself puts it down with drawbacks one would have never imagined. As a result, unsuspecting readers like me, who haven’t seen those films or are relatively new to cinema, might get completely carried away with the text. I do not hint manipulation here. Mr. Kolker does provide in-depth discussions of the films but is also careful enough to let the reader carry on with the discussion using the threads he has provided. Having said that it is a fantastic book on films and film movements, I must also point out that The Altering Eye is not for the causal reader. You will be going through a paragraph again and again or stuck in a section for a long time. But that is because the content of the book demands it. So if you are looking for a book on cinema that you would want to read with ease, this book may not be the right choice. However, if you want to seriously learn about serious cinema, The Altering Eye is absolutely essential. As always, nice writeup. I read this book a couple of years back. And this is definitely one of the best books I’ve read on cinema, a book, that I can read again and again and in this process discover something I had missed or not thought about before. Great review. I haven’t read the book, yet I have a feeling your writeup has done justice to it. Fine deconstruction of, as you’ve made it abundantly clear, a ‘heavy’ book. Great job! Oh man… you absolutely must read this one, even if this takes a year…. makes you feel both humble and proud! Hi JAFB, the download link isn’t working. Can you please email the pdf file to me? I’ve included my id with the comment. Thanks. I only have a hard copy of this book with me. I will check my archives if I have a soft copy and upload it if I do.